Since November 2015, FBI agents have been trying to get Tor developer Isis Agora Lovecruft to meet with them, but they won't tell her or her lawyer why. Lovecruft is a well know cryptographer who works on the Tor project, Open Whisper Systems, and LEAP. Since her first contact with the FBI, Lovecruft has had her lawyer contact the agents repeatedly, asking why they wanted to meet with her. The agents have said that she's not the target of an investigation, but also that they have agents on the streets in five US cities hunting for her, intending to have "a talk" with her without her lawyer present if they can manage it. They will not tell her or her lawyer what this involves. Lovecruft is in the midst of an overseas immigration process, moving to Germany, and the stress of dealing with the FBI harassment has effectively ended her ability to work. She fears that making contact with anyone puts them at risk of being served with a secret FBI order in relation to her. Techdirt's Mike Masnick writes eloquently about the effect that this kind of harassment has on one's mental equilibrium. The most shocking thing here is that the FBI won't discuss anything with her counsel. Even in the case of secret gag orders, lawyers are generally part of the discussion. To quote a frequent talking point from the surveillance state: if the FBI is acting legally, what do they have to fear from discussing their request with her lawyer? 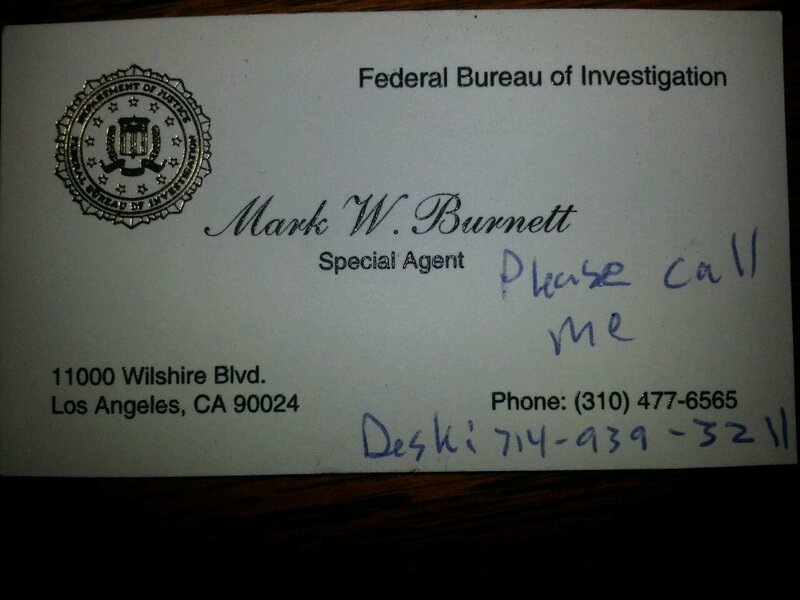 Agent: Well… as before… we would strongly prefer to meet her in person. We have teams in Los Angeles, San Francisco, Chicago, New York, and Atlanta keeping an eye out for her. Lawyer: Your colleague mentioned last time that you would accept a phone call? Agent: We would strongly prefer to meet her in person. We… uh… have some documents we’d like her opinion on. Agent: Anyway, if she’s available to meet with us, that would be great, thanks. Agent: Hello this is Special Agent Kelvin Porter, we spoke two days ago regarding your client. Umm… well… so the situation with the documents… it’s umm… it’s all fixed. I mean, we would of course still be happy to meet with your client if she’s willing, but the problem has… uh… yeah… been fixed. And uh… yeah. Just let us know if she wants to set up a meeting. Admittedly, I can’t even begin to understand what was going on here. Documents? Was this attempted entrapment? Or were they using this as bait to get me interested in meeting them, so that they could ask about something else? I mean, help me, please — I really don’t understand what the FBI’s strategy was here.